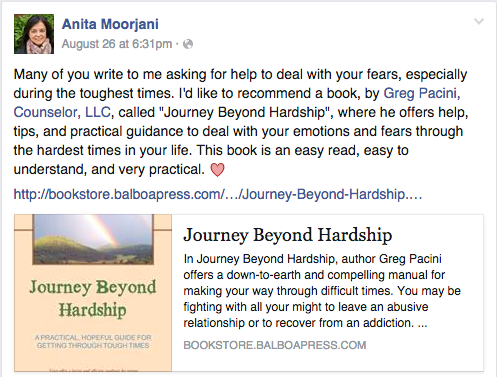 New York Times bestseller, Anita Moorjani, posted the endorsement below on her Facebook page just days before her dear friend and mentor, Dr. Wayne Dyer, died. Dr. Dyer wrote the foreword for Anita’s bestseller, “Dying To Be Me.” She and Dr. Dyer became close colleagues, eventually leading major workshops together around the world. Anita, I and her staff began communicating last year. 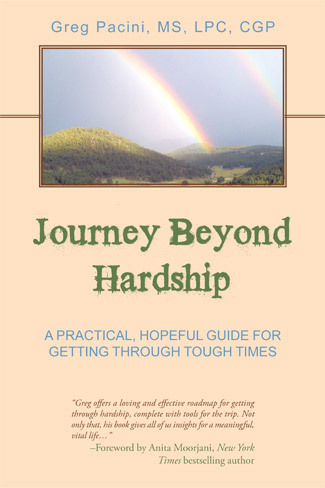 Those early exchanges led to Anita’s willingness to write the foreword for my book, Journey Beyond Hardship. We continue to stay in touch. Anita is a remarkable woman with a remarkable experience that baffles the medical community: complete recovery from terminal cancer following a Near Death Experience. I read Anita’s book years ago, and have it available for clients in my office. When my book was nearing completion last year the question became, who might be willing to endorse it? Anita was one of the first people who came to mind. Her work had become a poignant reference in my new book. More importantly, her loving presence reflects well the spirit I intend my work to express. I feel fortunate that she graced my book with her involvement. Anita returned to the public eye this week for the first time since Dr. Dyer’s death and reports feeling his presence and support. Look for Anita Moorjani’s new book next Spring.